I always like to know details about the creator/designer/manufacturer of the watch I like. It is the human touch that makes it more interesting, so, after the view of the One Hertz, I prepared some questions for the Horological Brothers. The Grönefelds are based in Oldenzaal, Netherlands, and they own a small watch shop/manufacture inherited from their grandfather Johan Grönefeld, which I think was very proud of his grandsons. Since they are two, I asked four questions. They decided to answer together all the questions. 1. When you started the WOSTEP studies, what employer did you have in mind (the favorite brand maybe)? After our WOSTEP study we were meant to go back home and take over our parents jewelry and watch shop. Our WOSTEP teacher, Mr Simonin, is a watch collector himself and he showed us some of his amazing haut horology timepieces. This made us realize that we really wanted to go into this direction. Luckily we were invited by a manufacturer of high complications called Renaud et Papi (now Audemars Piguet) to come to work for them. 3. What was the most time and mind consuming caliber/watch that you have ever worked on? When we started to work for Renaud et Papi we were in charge of assembling minute repeaters. We found it very interesting to work on them. There are many different forces and angles to take in account to make them work reliable. At first it was a huge challenge to get them right. Making mistakes, thinking how to resolve, improving parts etc. etc. was an interesting journey. The next step up is the Grande Sonnerie mechanism. More parts, more delicate functions but also less reliable. Therefore our number one mechanism is the minute repeater. 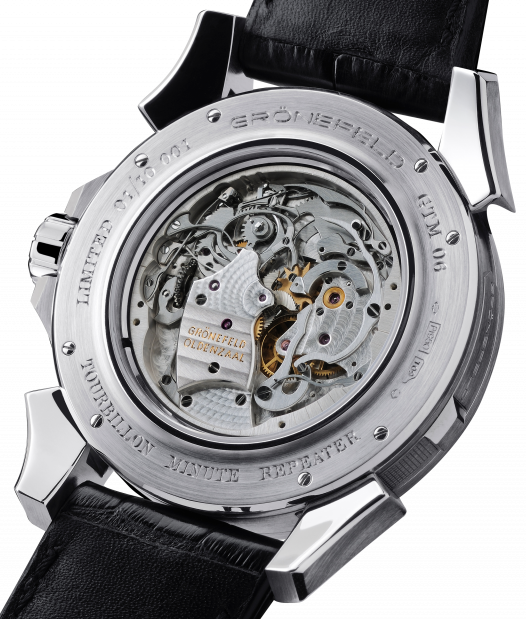 There are indeed companies that are specialized in cooperating with colleague watchmakers/companies. To name a couple: MB&F and Maîtres du Temps. While it can be interesting to get a boost for our own brand we are very happy with the exposure we got by doing everything by ourselves. But we are always open to discuss possibilities in mutual interest. Mr. Antoine Simonin is a well known expert in watchmaking and watch industry, an acclaimed professor, an author of specialty books and an avid collector of fine and complicated timepieces. Beauty is in the eye of the observer and good taste will remain forever good taste. After the One Hertz, the Parallax Tourbillon was a great design, beautiful, precious. I will wait patiently to see their new timepiece. I am sure it will be worth the waiting. The minute repeater is an extraordinary complication. Maybe it sounds ridiculous, but it is really a hard to get complication. Starting with the movement itself and ending with the bells in the case, this complication touches not only the eyes but also the ears of the holder. It is not only the sound of the escapement, it is a complex sound of the hammer striking on the bells. One of the most beautiful designs of Audemars Piguet, in my opinion, is the Jules Audemars Grand Complication. It has what I like in a watch: open work dial, moonphase, perpetual calendar, chronograph and minute repeater. 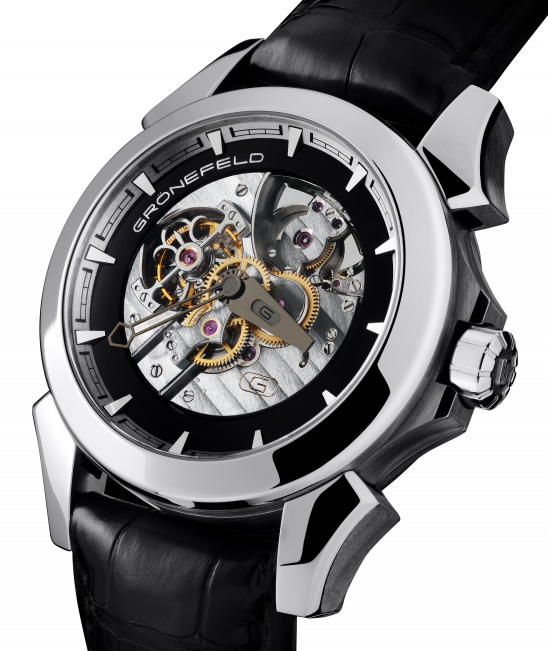 The Grönefeld brothers have their own minute repeater – GMT-06 Tourbillon Minute Repeater – a beautiful open work tourbillon with modern, industrial design hands and a nice open back case revealing the beauty and the finishes of the caliber G-01. Since this was their brand first design, it was a big, dangerous step and they made it without hesitation, entering strong in a market with a lot of competition. MB&F and Maîtres du Temps combines the specialties of several watchmakers and designers to create special machines. One of my favorite collaborations of Maximilian Büsser are the Legacy Machines where, together with Kari Voutilainen and Jean-François Mojon, they made this beautiful suspended over dial balance wheel. Under the name of Maîtres du Temps, Mr. Steven Holtzman worked together with Kari Voutilainen and Andreas Strehler to create the Chapter Three – a watch without compromises. I would like to thank Bart and Tim Grönefeld for their time and amability, it was a pleasure on all the occasions. They can be contacted on the telephone: +31 6 20624673 or by email: info@gronefeld.com.